First of All a Happy New Year to you all. I took quite a break there and my blog is going to look a little different to all of you as I slow down and pull back but the one thing I’m continuing is sharing the cottage garden. 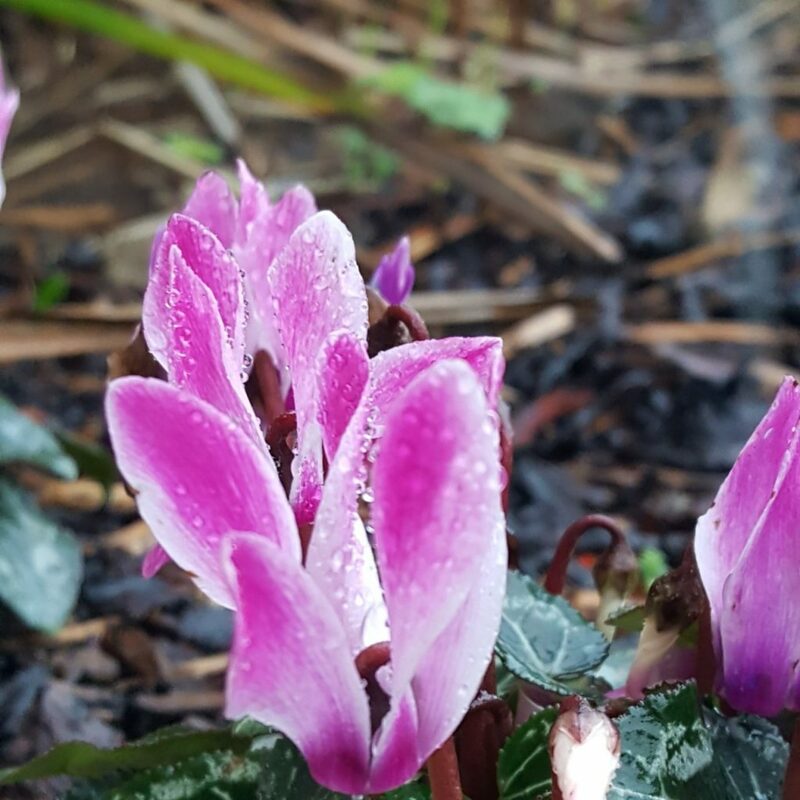 Back in October, I was preparing for Spring and in this post I said that I was testing out cyclamen. They have lasted incredibly well so I will be investing in corns so that they can naturalise in this spot. My dear readers, you were right in the comments, testing the area and living with it through the winter season I can now visualise what I would like this area to be so thank you! Remember how I said my garden is confused? Well, these are my daffodils that I planted. We shouldn’t be seeing these for another few weeks but here they are. I checked older plantings around the cottage borders and they are also at similar stages meaning that these blooms will be here from the end of January through to February. While the snowdrops and crocus here are still sleeping. It’s a conundrum which will see me buying a few more bulbs to continue the colour. Yes I am the mad person who was out planting 300 tulips this week and they don’t go as far as you might think. Ah, the primrose, the alarm clocks of my garden. 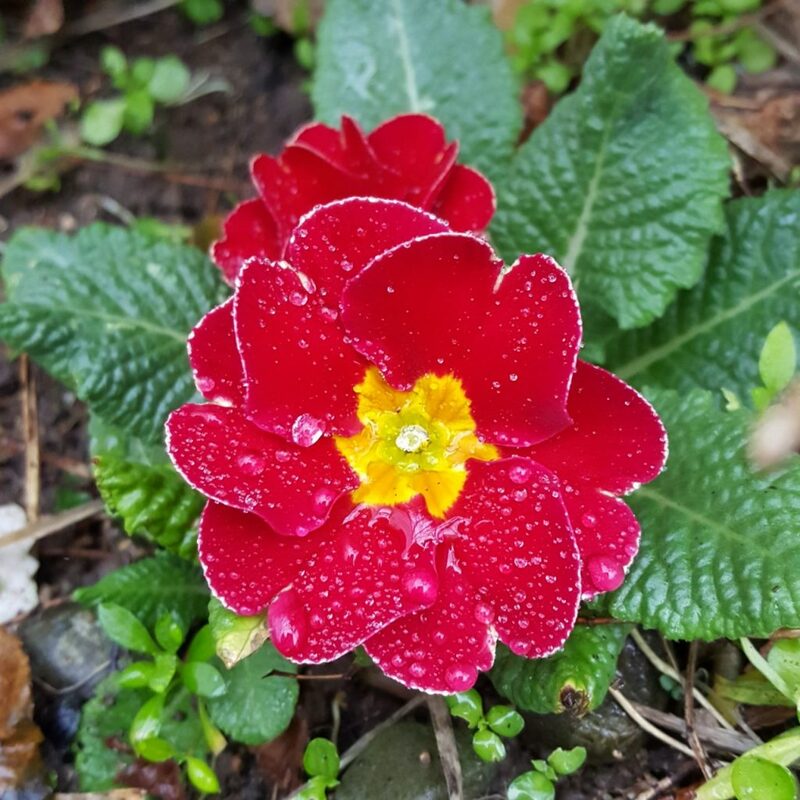 I have quite a few primroses that I have dotted around the garden and they are in full bloom right now. Again a little earlier than last year but it is nice to see their happy strong colours around the garden. I don’t lift mine, I just plant them and leave them and I get 2 to 3 blooms from them in a year. They usually signify that my garden is waking up. Living by the sea I would never be without heather in my garden. It adds shape structure and colour but more importantly it’s in bloom while much of the garden is asleep. This means you can usually find some bees that are also a bit confused hanging around here. I like having washes of this heather edging borders or mixed in with later blooming shrubs. 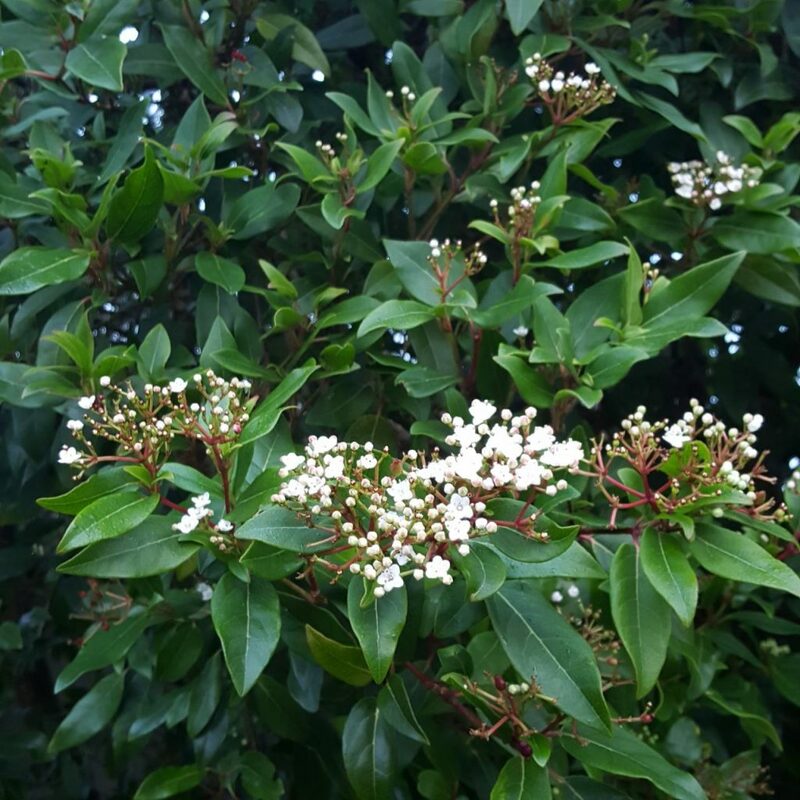 I *think* and maybe you can help me here that this is a viburnum. It is a magnificent addition to the garden but I inherited it so I’m guessing at best as I have never had one in any of my gardens growing up or rented accommodation before. 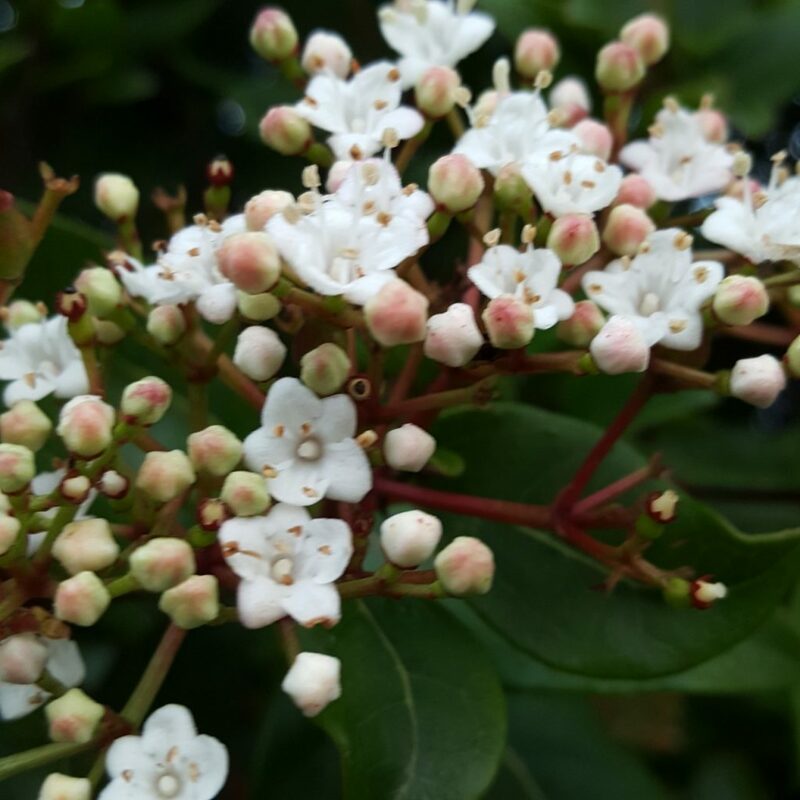 I love it’s blooms and it gives 2 flushes in the year with delicate pink tinged flowers that open and have a slight fragrance. Remember when I said that my garden was confused and it would have an effect on the harvest? Well enter case number 1 (I’ll continue this next week) but this tree should not be awake for another few weeks. I left her outdoors and now need to bring her into the greenhouse. Yes I forgot and I’m lucky that she is sheltered but the damp weather is goign to cause me a few issues with peach leaf curl. The problem with her going into bloom so early is pollination and heat. While I can hand pollinate her the problem lies in the fruit setting but also protection in the coming weeks if the weather gets truly bad. 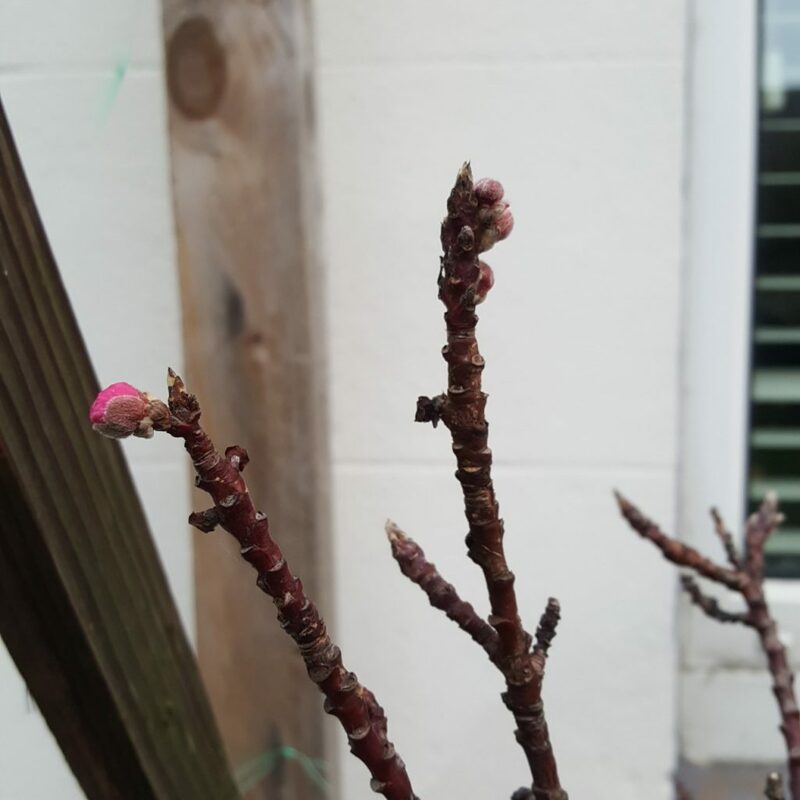 Luckily I can move her to the greenhouse or inside to the conservatory but to some of the other fruit trees I have that isn’t an option. They are all breaking bud at the moment, everything here is which leads me to wonder about pruning. I would normally leave this until February but I’m unsure this year. What are your thoughts? That’s it from the cottage garden this week. Do make sure that you pop over to The Propagator ‘s page to check out more wonderful gardening posts and why not search the #sixonsaturday tag on twitter too to fill your feed with beautiful blooms. There is also a participant guide here if you would like to join in too. Looking forward to catching up with all of your garden posts this week too! Hello, yes, we are here, waiting for you to post, waiting to see what you are up to. I am new to your blog and get it through email so I am hoping you will continue and not go just to Instagram. I did discover you on Instagram but that’s like a teaser, a picture and a few words. It drove me to seek out your blog for more in depth content so I hope you don’t give it up. I like Instagram for a broad overview or a quick scroll through ( but it just scratches the surface). Honestly, it’s a sign of the shallowness of our times. That said, I will enjoy your blog as long as you will keep writing, knitting, gardening and journaling…by the way, we enjoy all of those facets of you, as we are all more than just Knitters too. hi Martha, Thanks for joining in. How I run the blog is I only send out an email once a month and only IF I have been blogging. I took a much-needed break at the end of 2019. I don’t have blog posts by email enabled so you won’t get a post by post update. I was worried about clogging up everyone’s email. The garden posts go out on Saturdays and craft posts go out on Monday or Tuesday. Still planting tulips eh? They’ll be fine, maybe a bit late this year. Feeling good about my 200 crocus too. I have daffs coming up all over, there s normally some up out the front by new years. They won’t flower for a couple of weeks though. 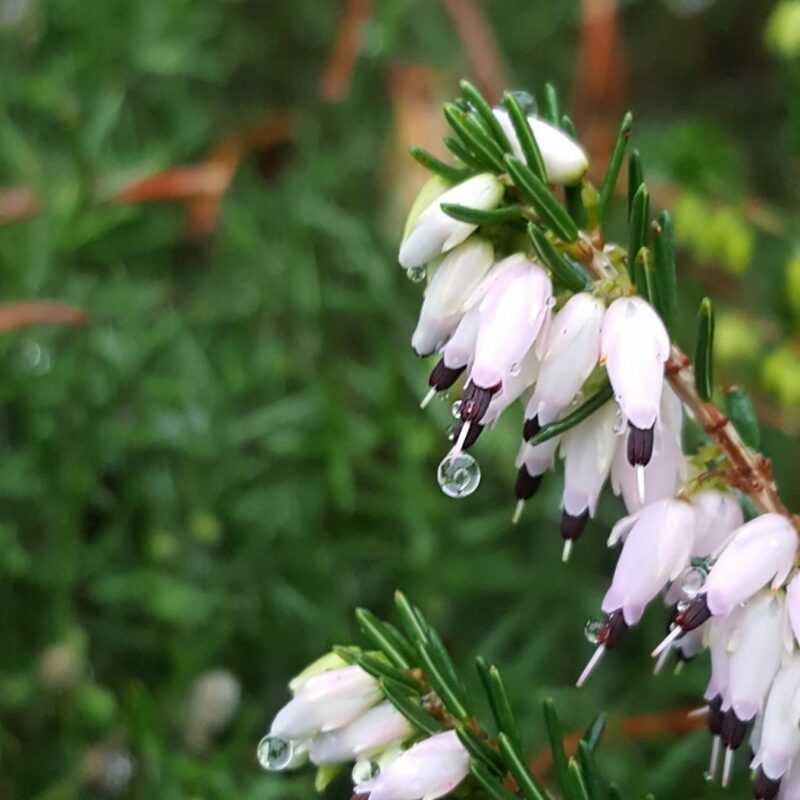 What a gorgeous close-up of your Heather! Yes, it seems like your plants are confused as to when it is time to start their shows — but — I think we all have that happen. LOL I need to add some Primroses to the garden this year. So pretty! Fingers crossed that you will keep it (and others to come) Maybe a hand pollination coming? That’s what I would do. Hand pollination would be our only choice, you’re right. It’s a small tree it won’t be much effort. I popped it in the greenhouse today along with bottles of water as a heat source so, fingers crossed. I’ve also taken in the chillies. Lovely, lovely photos of your garden! Everything looks green too! I love the colour of those Cyclamen plants – I’ve only ever tried growing them as houseplants, but I might attempt some outdoors if I can sneak them into the garden without Mum noticing (it’s her garden, I have the allotment). 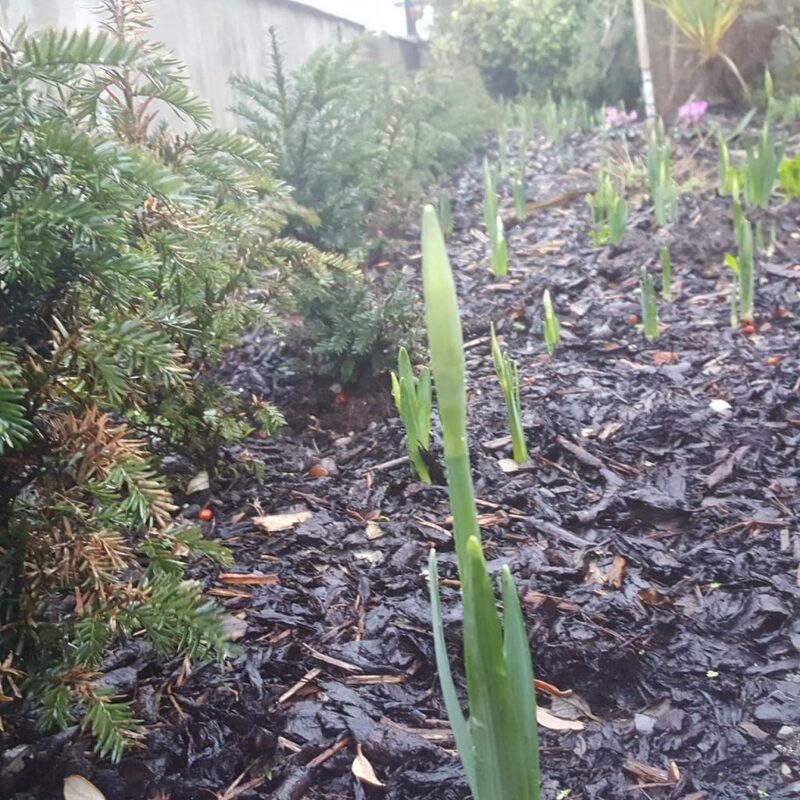 Hopefully your confused Daffs won’t be too badly affected by the wintry weather they’re forecasting though. I’m on the east coast of Ireland and these are in the front taking the brunt of the Irish sea and it’s breeze, so I’m a little shocked to be honest. They have a little protection but not much so I’m hanging on to anything that grows there. Lovely pictures. I have lots of bulbs coming up too, but hopefully the cold weather will slow them down. Thank you. I’m hoping the same. I have tulips and bulbs all around my containers too that all seem to be waking up :/ Time will tell.